It may not be chilly enough yet to justify blanket scarves or heavy coats, but it's the perfect time of year to add a lightweight cardigan to your wardrobe. Particularly if you have a trip on the horizon (apple picking upstate? A weekend spent in a treehouse you found on Airbnb? ), the piece marries comfort, style, and practicality: It's easy to pack, it's not so bulky you can't add a jacket overtop, and it's far cooler than its reputation might suggest—especially if you choose one of the styles we've rounded up below. Wear Everlane's boxy version with cropped wide-leg jeans and slip-on sneakers, or try Doên's cable-knit cardi with a midi dress and loafers. Even fashion-forward styles, like those with all-over embellishments (see: Alice and Olivia's) or metallic trim (Gucci, of course), are versatile enough to pair with almost everything in your closet, whether for a long flight or a day at the office. Below shop 17 cardigans you'll want to layer with everything this season. This brilliant Yves Klein blue pairs well with crisp white or blush pink. This upstart brand makes killer knits. This striking shade of mustard yellow is more flattering than you might expect. A comfy, swingy style you'll want to throw on every day. The vintage bow collar is super sweet. Don't shy away from fun prints. The neat striped trim looks super-luxe. A subtle way to embrace the pearl trend. Between the bell sleeves and the tortoiseshell buttons, this style is so chic. A cozy elongated cardi is a wardrobe essential. We're shopping this in every color. This Gucci style is a classic. How rad are these pink rhinestones? It doesn't get much more lightweight than a sheer, paneled style. Pockets that actually fit your phone: a major plus. 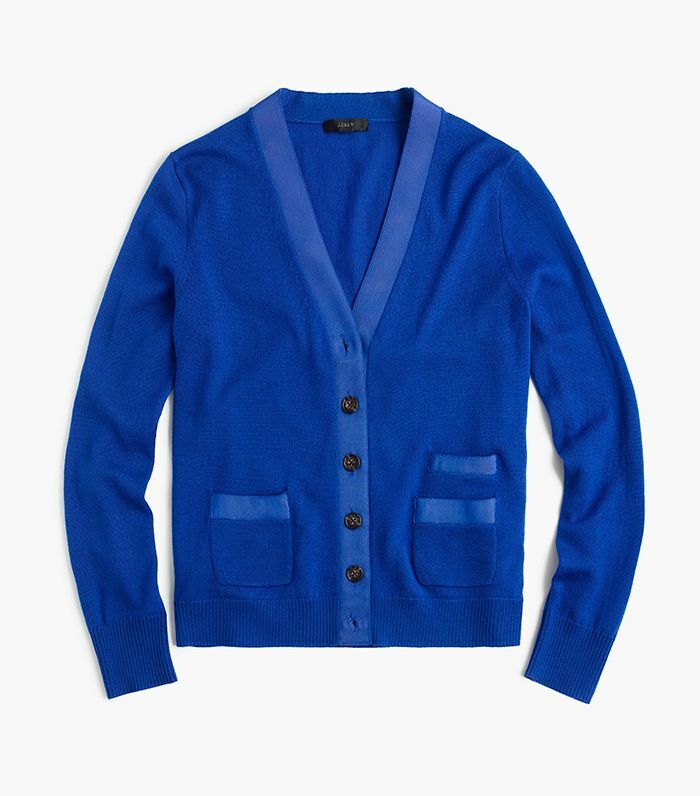 This cool cutout cardigan goes with pretty much everything. It's no surprise that J.Crew knows its cardis. Next, get inspired with 10 graphic tee outfits to copy this season.